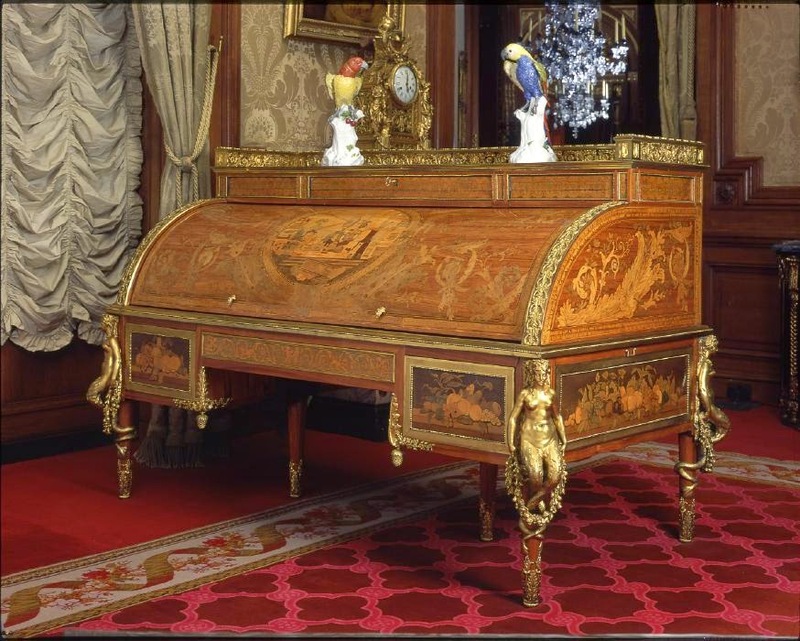 Although the desk is not stamped, the high quality of the marquetry and complexity of the mechanisms have led to the general consensus that it was the work of the master cabinet maker Jean-François Leleu. It was made between 1777 and 1781. Inlaid on the writing slide is a trompe l'oeil depicting the title pages of two pamphlets in support of American independence, once of which is known to have been penned by Beaumarchais in 1779. The marquetry reflects Beaumarchais's tastes; scenes which depict Roman ruins after Hubert Robert and Giovanni Paolo Panini echo pictures in his collection. The top of the desk has three panels based on engravings after Panini - they can be raised to resemble prints or paintings on stands. Scenes on the themes of Astronomy and Optics, from engravings after Jacques Lajoue, decorate the lid and back of the desk, and testify to Beaumarchais's interest in science. Beaumarchais's ownership is a strong presumption but it is not absolutely proven. The 19th-century commentators are not consistent. 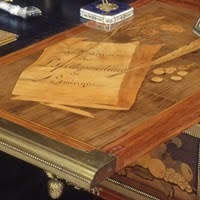 Beaumarchais's biographer Louis de Loménie writing in 1856 describes a "secrétaire" in Beaumarchais's study, adorned with marquetry, which had cost over 30,000 francs. Other 19th-century sources say he received it as a gift from "friends". If the desk had indeed belonged to Beaumarchais it would have been among the furnishings his hôtel on the Boulevard Saint-Antoine. Yet it is not included either in the description of the contents of the house made when the Revolutionary sequestration order on the property was lifted in February 1794 or in the inventory made after Beaumarchais's death. The desk was offered as a prize in the national lottery in Paris in 1831, each ticket costing 50 francs. The tickets stated that the desk had been made by Reisener for Beaumarchais at a cost of 85,000 francs but did not give the name of the present owner. It was acquired shortly afterwards by Edward Holmes Baldock, an English dealer in French furniture and porcelain, and was subsequently purchased by the Duke of Buccleuch, then by the Baron Ferdinand de Rothschild.